“Electrical Engineering” is the field where we deal with the energy that runs our world. It can be exists in various forms like gas, fuel cell, turbine, hydro, solar, wind or geothermal energy. Electrical engineering has the complete knowledge to utilize and distribute these energies out from their sources to our factories, home, hospitals, school and offices, and our life. And it does not stop here. Today, electrical engineering not only involves in electrical appliances, but also involves in computer, electronics, communication and mechanical fields. Do you have a computer or cellular phone? Off course! Electrical engineering is there. 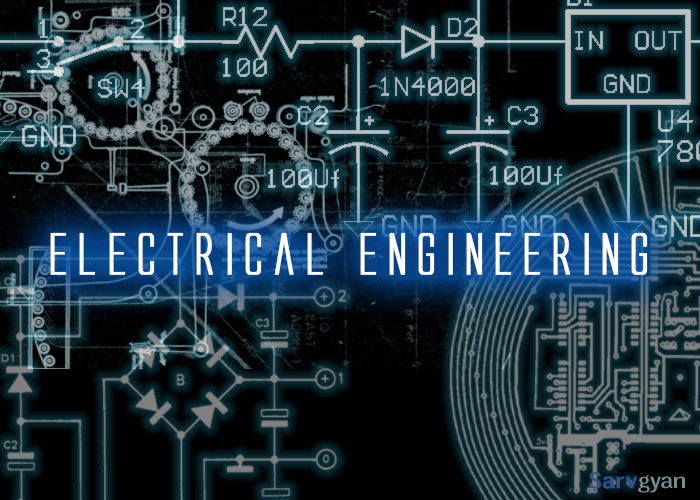 Electrical engineering is one of the selectable disciplines in the field of engineering and technology. Electrical engineering has been adopted in professional education in the year 1882. In the year 1884, the great physics Thomas Edison has provided the 110 volt’s DC electricity to his 59 customers in Manhattan City in Newyork. Electrical engineering is divided into many subfield that include electronics, digital computers, power engineering, telecommunications, control systems, radio-frequency engineering, signal processing, instrumentation and microelectronics. Electrical engineers commonly holds a undergraduate degree in Electrical Engineering. Get Latest Career Notification about Electrical Engineering, by entering your details below. Electrical engineering is an exciting filed of engineering and technology. Electronics engineering and electrical & electronics engineering are the close related to this field. The duration of the total course take four years. Beside these, it is one of the broad research fields leading to the PhD (Doctor of Philosophy) degree. For entering in PG (M.Tech) programme, B.Tech in Electrical Engineering is must. Electrical Engineering has expanded in various specializations as the following. After completion of UG degree the students are designated as the Bachelor of Science, Bachelor of Applied Science, Bachelor of Engineering or Bachelor of Technology (B.Tech), depending on the University. A bachelor degree usually covers the mathematics, physics, project management, and computer science. There are so many specializations or sub-disciplines in electrical engineering but to choose in higher degrees after completion of bachelor degree. Have you completed your 10+2 examination? Then go ahead and pick the right one as of your interest. You can choose the Electrical Engineering, once you have completed your 10 or 10+2 examination with mathematics and science. B.Tech is the most sought course in the field of electrical engineering. Every year, many students take admission in this course. Admissions is done through entrance test. After completing 12th, students can apply for JEE Main 2019 in order to take admission in undergraduate engineering courses. Those desiring to get into IITs or NITs are required to succeed the JEE Advanced 2019 which is the second stage of JEE Main. For getting admission in postgraduate engineering courses, students have to qualify the Graduate Aptitude Test in Engineering (GATE 2019). This entrance test is the gateway for admission to PG courses. Besides these entrance exams, there are many other state and University level entrance exams which provides admission to electrical engineering. There are lots of job opportunities in the field of electrical engineering. An electrical engineer designs, develops and maintains the electrical control system to the required specifications, and focusing on economy, reliability, safety, sustainability and quality. Building industries and services, transportation network, construction and manufacturing, and production and the distribution of power are some of the specific fields of career development. An electrical engineer can work with the industries deals in product development, system management, product design, sales, amusements, consumers’ electronics, transportation, wireless communication, manufacturing, chemical, automotive, defense and pharmaceutical. Higher studies option are also available for B.E./B.Tech graduate in Electrical Engineering. Candidates possessing master’s degree in this field can choose their profession in teaching field and can further go for research work after getting doctor of philosophy degree in electrical engineering. In India, a fresher who has cleared the degree in Electrical Engineering can get the offer of salary started from 2 lakh per annum upto 5 lakh per annum. In abroad, the average salary of electrical engineers is $65000 per annum. Are you brilliant and having a higher degree in electrical engineering? Don’t think about the salary because “sky is the limit”. For any queries regarding Electrical Engineering, you may leave your comments below. I love to disassemble electronic products..
Should i go for electric engineering…? I take admission in nit Srinagar in electrical branch. Is my college is good for me. I have done my btech in electrical engineering..want to do job..bt don’t have any experience ..i m fresher then where i have to apply for job..
Now I am in 2 ND year of electrical engineering then what are the study books I want to refer for AMU exam t now to crack this exam in 2020. Sir now im in indian navy . Im doing AMIE through electrical branch. My service is 4 yrs now & im leaving it after 15 yrs. So can u plz suggest me what to do after compl. of amie. Im in big doubt. i want to become electrical engineer and sarvgyan is helping a lot by its website to clear the doubts about courses. so thank you very much sarvgyan. Hello sir, IsElectrical trade in Polytechnic is good???? I comeplete 11th . and i am reading 12th … i want to electrical engineering.. I hve completed diploma in electrical engineering from govt college but now there is no govt college under ip university for ee for lateral entry. . Yes it is a good branch, Electronics & comm. is also good. You have to complete B.Tech to become an electrical engineer. sir after doing diploma . what should I do?? Sir,What to do after completing engineering. which is the best job in electrical and explain about that job and give a suggestion for my career. Thanks I really want this add , bcs this year is my last year in diploma in electrical eng. thank u veryy much again. Sir I m from UP but At this Tym in m doing Diploma in EE from Punjab stase can i take lateral entry in b.tech from EE ..
Yas, u will take leet in b.tech with the help of a test …. Sir, How to prepair for k group in polytechnic? You should prepare from your text books in diploma, you can practice Aptitude and reasoning based questions. fill the form under K group. I want to do electrical engineering. . How can I do online.